I want to buy your multipack of Ricoh Aficio SPC232DN toner cartridges but when sending my order through it came up that you only sell in the UK. Is it by any means possible to pay in advance to your bank account including all shipping costs and VAT (if needed)? Please advise? Regards, Sven Gjessing. Unfortunately, we're only able to ship orders to addresses within the UK. 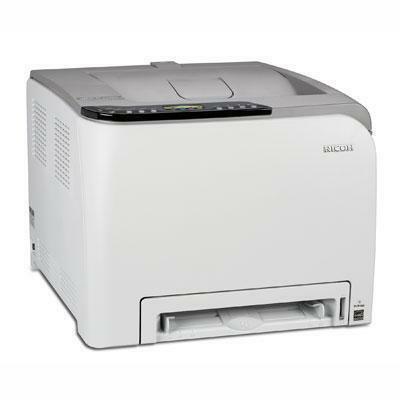 Designed with small to medium businesses and workgroups in mind, the Ricoh Aficio SPC232DN toner is both a cost effective and reliable colour printing solution. Easy to set up and maintain, the machine provides great printing speeds of up to 20 pages per minute in both black and white and colour. The durable device promises a maximum duty cycle of 30,000 pages per month alongside a low cost per page figure and low total cost of ownership amount. Alongside its speed and power, this printer offers great image and text quality with crisp and clear prints of up to 2,400 x 600 dpi. The printing settings and functions can easily be changed or maintained via a simple digital and button-operated panel. The compact Ricoh Aficio SPC232DN toner is designed as an office space-saver and will fit easily on top of most business desks and tables. The machine measures a slight 400 x 450 x 320mm and weighs less than 23kg. It boasts an amazing standard paper handling capacity of 250 sheets in one tray - increasable to a maximum 750 sheets if needed - and a 150-sheet paper output storage. Packed with power, the Ricoh Aficio SPC232DN features a 300MHz processor with a standard 128MB memory that can be expanded to 640MB. It promises an environmentally friendly operation with no toxic materials used and a handy energy-saver mode. The machine also has great network connectivity via an Ethernet port and wireless connectivity as well as a great high-speed USB 2.0 port. The Ricoh Aficio SPC232DN toner is for the consumer looking to minimise environmental impact and save costs. An energy-saving mode and the promise of low operation costs are some of the great features of this machine. The speed for the Ricoh Aficio SPC232DN toner is a little slow compared to similar devices.